Landscaping is a very broad term that encompasses a number of different things. Most people associate landscaping with nothing more than installing a lawn and planting flowering shrubs and bushes. But the fact is that it means far more than that. Landscaping is an art and a science that is used to create aesthetically appealing, functional and sustainable outdoor spaces on residential and commercial properties. It also involves upgrading or changing existing features so the spaces are more in sync with the architectural elements of your home. For all types of landscape planning and installation services, we are the experts to call. At Keenkut Landscaping, we’re passionate about what we do and it’s how we have built a vast customer base in and around Westfield, Agawam, and West Springfield. Our high-quality services have earned us the trust of commercial and residential clientele in Longmeadow, Springfield, and Chicopee. 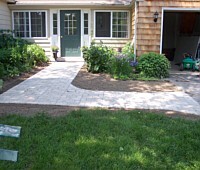 We have completed a large number of landscaping jobs in Windsor Locks and Holyoke. Word of our expertise has spread to East Longmeadow, Easthampton, and the surrounding areas as well. We strongly believe that a well-planned landscape becomes the perfect backdrop foryour beautiful home. Unplanned gardens and yards not only affect the curb appeal of your property but take away from the beauty of your home or business. First impressions count especially with reference to a business. Meticulously planned and expertly installed custom landscapes indicate to your clients, customers and visitors that you are serious about your business. The landscaping has an important role to play in case of a residential property too. An unkempt or poorly-planned landscape will leave a very bad impression on your guests, impact your home’s curb appeal and value. Our experts will meet you at your site and discuss your requirements. The design phase is very important; this is where all the plans are drawn and materials are finalized. Once you have approved the plan and quote, we start on the actual installation. When you hire our landscape design and installation services, you are assured of the best products and superior workmanship. The work will be completed professionally, safely and in a timely manner within the approved budget. The objective of this approach is to ensure you get spaces that you will love to use. The features will be practical and materials durable, ensuring the resilience and longevity of your landscape. Over the last 10 years, we’ve helped businesses and homeowners across the region create the kind of landscapes they have envisioned for their properties. When you want reliable, professional services at very competitive grading and excavating cost, you need look no further than Keenkut Landscaping. You can speak with our experts at 413-896-9240 to discuss your project details or send us queries and quote requests through this Contact Us form and we will respond shortly.